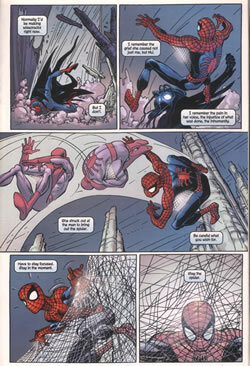 Marvel Comic built their reputation on an ability to depict convincing action in the pages of their comics. Most of the credit for this has gone to Jack Kirby and certainly he deserves the lion's share of the praise. 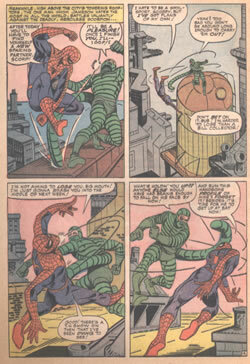 But Kirby's Marvel stablemate Steve Ditko was no slouch when it came to portraying human motion, nowhere more convincingly than in the pages of his legendary run on the Amazing Spider-Man comic from 1963-1966. So strong was Ditko's stylistic stamp on the art of Spider-Man that even to this day, artists like John Romita Jr are heavily influenced by the original Ditko version, an influence that even extended to the movie version. 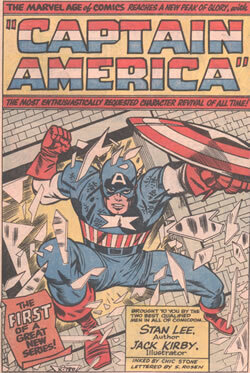 This is the splash page of Captain America's first solo adventure in the Silver Age and Kirby, as original co-creator of the character, give his one helluvan entrance. The debt to Steve Ditko - forty years on - is plain, particularly in John Romita Jr's multiple imagery in the central panel of the page. Pure Ditko style.